Round Here: MFT Cooler with You Card Kit Release! MFT Cooler with You Card Kit Release! Hello! It's time for the release of the newest card kit from My Favorite Things, Cooler with You! This kit is so fun and has everything you need to create winter themed cards and interactive snow hills. 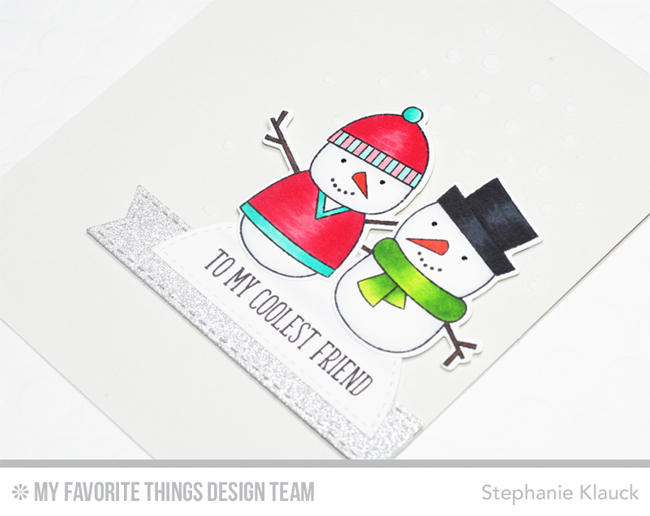 For my card tonight I used the adorable snowman images to create a simple scene. I love that the stamps and dies included in this kit can be used for detailed winter scenes or clean and simple cards. I first used the Snowfall stencil to add some white embossing paste to a Grout Gray card base and then I set that aside to dry while I worked on the rest of the card. I stamped, coloured and diecut my snowmen and then I adhered them together so it looks like they are hugging. I diecut a half circle using and stamped the sentiment along the bottom before adhering it to a sparkle silver banner. 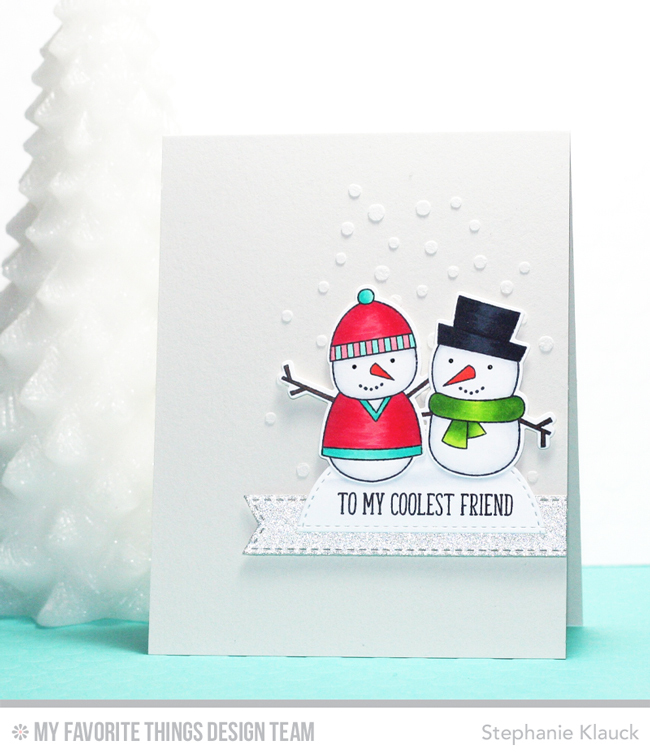 I then adhered the snowmen to the snow hill and added the entire piece to the card base. Make sure to head over to the MFT blog for more inspiration using this months kit! You can find the full kit for sale now at the MFT online store. Cute card! I love these snowmen!!! Cute! Love the mini background behind the snowmen. Using Grout Gray for your background color was a great idea! It gives the white snowy appearance for the whole card (at least on my screen), but still allows the actual white snow and snowmen to stand out. Your card is super cute! Super adorable! Thanks for a chance to win. Nice clean and simple card! And I loved the colours you used on the snowmen. They are super cute! So cute! I love the little bits of snow behind them! So cute.I love your desing and coloring!! Super great card kit! Love the texture with the falling snow and the little pop of glitter with the banner. Also love the hugging snowmen. Cute sentiment and card. Very nice. I love the hugging bear friends. So cute. Thanks! Beautiful coloring--love the way you stenciled the background! How sweet--I like the snowy background. That's a really great card! Love the crisp white. So many wonderful details on this card from the snowy background to the stitching and glittery banner! The snowmen are completely adorable and beautifully colored, too!!! Thanks so much for sharing!!! This is so sweet! I love how you created the snow in the background. Thanks for sharing! Such a cute card. I love all the white with the snowmen having the only color. Also like how there is just a sprinkling of snow behind the snowmen. Cute as can be! It makes me smile!! Love the partially embossed background & the clean look of this card. The sentiment is one of my favorites as it can be used year round! Cute card! Love the snow in the background! Sweet card! Love the snowmen... great coloring! Love the red V-neck sweater on the snowman! just part of the card.